How many episodes of Charlie's Angels have you seen? Charlie: Once upon a time, there were three little girls who went to the Police Academy; and they were each assigned very hazardous duties. But I took them away from all that, and now they work for me. My name is Charlie. Who didn't watch this show?? OMG, I grew up watching this show! Well, at least the first 30 minutes each week as I was in elementary school and my bed time would not allow me to watch the whole episode unless it was the holidays or summer. However, this was my favorite show growing up, I loved it! There were Charlie's Angels dolls, bubble gum cards and stickers and on and on and on. We used to play Charlie's Angels in the neighborhood and at recess as I was like any other little girl in America during this period. 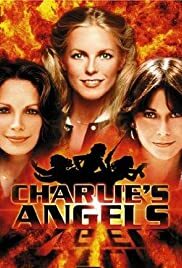 I loved Charlie's Angels, played Charlie's Angels and wanted to be just like Jaclyn Smith when I grew up. I think it would be neat if they did a reunion at some point. Now my generation is bringing it to the big screen! Great stuff!